Aviso: Although I am an intuitive reader, most but not all of this article is based on psychology and common sense. I always believe in using common sense first to solve one’s problems. That being said, every person’s situation is specific to them and there are exceptions to any rule. Each person must thoroughly evaluate their own situation. This article is meant only to provide general observations and helpful hints. I have had so many clients who have had broken hearts, indeed I have been broken hearted myself and it was very painful. Heartbreak can manifest into actual physical problems. The American Heart Association says “Broken heart syndrome, also called stress-induced cardiomyopathy or takotsubo cardiomyopathy, can strike even if you’re healthy. (Tako tsubo, by the way, are octopus traps that resemble the pot-like shape of the stricken heart. )” Unfortunately, this can be misdiagnosed as a heart attack or lead to temporary heart muscle failure. Fortunately, most of my brokenhearted clients were able to pick themselves up and find an even better relationship by following the guidelines below. The first thing I do in my consultations with individuals who are broken hearted is to determine if the client’s relationship is actual. Some people have relationships with others that are in their minds only or vastly exaggerated. That doesn’t mean that those individuals don’t feel the immense pain of heartbreak, but they may require somewhat different advice. People who have had real fulfilling relationships and have lost those relationships feel as though their lives are over and they will never love again. They often feel great mental and physical pain. It is most important that they do not become addicted to that pain and perceive their lives as some romantic tragedy that they choose to remain in for a prolonged time. Given all the romantic literature and movies devoted to such subjects, it is no wonder that individuals relate to what they have seen portrayed in movies or read in books. It is vital for a person who wants to have a real relationship with another individual to not become a romance addict. The psychological literature often refers to this as being a “love addict”. I believe that that nomenclature is misleading because the word love is so squirrelly. It means different things in different circumstances. Addiction to romance has to do with becoming addicted to the rush of endorphins one experiences in falling “in love” romantically, followed by the crash that occurs when the love object departs or does not live up to being an idealized person. This in turn is followed by the recitation of the latest romantic tragedy to friends and others, which serves to bring attention to the sufferer in such a way that portrays them as the hero or heroine of a romance novel. This cycle needs to be broken before a healthy love relationship can ensue. For the past week or so I have been thinking about traditions associated with the New Year. It seems like some people think it is the day you are given off from work to recover from a hang over. Others watch the Rose Parade or eat dinner with their family. People who believe they have bad habits make New Year’s resolutions to change them. So I decided to write a post about the New Year’s traditions and customs of people I know. 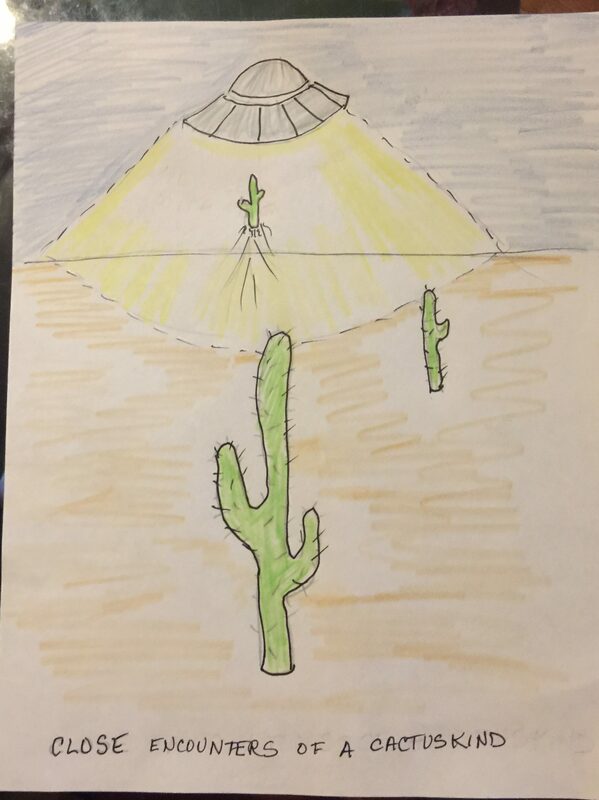 It would be easy to just write down things gathered by others on the Internet, but I wanted customs that living people have seen or done themselves. In my family when I was a child there were two odd traditions we practiced. The first bite of food had to be an apple on New Year’s morning or you might be sickly that year. This was meant to insure health and well being for the year. As an adult I continued this tradition and added something. 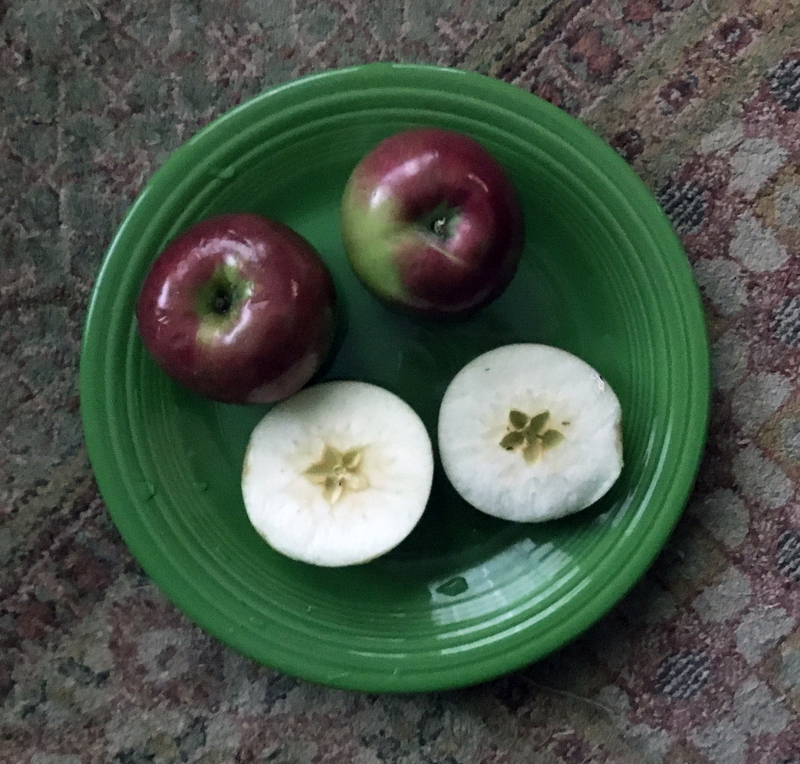 I the apple cut in half sideways and a new star can be seen that no one has ever seen before. This is particularly appealing to children, especially if they are told that you and they are the only ones who will ever see this New Year’s Star and they can make a wish on it before they eat it. We also ate pickled herring, at least one piece, during that day, as a start to the major meal. My father was particularly adamant about that. I didn’t much care for the taste as a kid. I wonder if this tradition was rooted in the fact that all male members of my father’s family worked in the ship building business at some time in their lives and this hailed back generations to North Atlantic and North Sea origins. Even my mother’s father and his family worked in this trade and he shared the herring tradition. A French friend, Vanessa, told me of a special egg dish made with truffles, called brouillade aux truffes, that her family ate for breakfast on New Year’s morning. It features softly scrambled eggs, black truffles and a lot of butter. A Greek-American friend, Marina, spoke about a special bread called Vasilopita, that her mother ordered ahead from the local baker in Astoria. It is round and sweet and inside it there is one coin. The head of the household would cut the bread. The first piece was for Jesus, the second for the household, the third for the father, the fourth for the mother, and then the next pieces were for the children in age order, starting with the oldest. Whoever received the coin in their piece was very lucky because it was considered that the new year would be their year. Angie, an African American woman from the South (who works with another friend of mine) cleans her home meticulously in preparation for the New Year. Everything in the home must be cleaned including all linens, curtains, shelves etc. so her family can make a fresh new start for the year. Not to do so would insure bad luck. On the other side of that coin, I have heard it said that to enter the New Year with an empty pantry can bring poverty or hunger in the coming year. A former schoolmate of mine, Roberta, who came to the US as an adolescent from Livorno, Italy, said that in Livorno they throw old dishes out the window to rid themselves of stale energy, but this New Year’s Eve in Florida she ate black-eyed peas for good luck. As a child, Paul from Canada, poured molten lead into water on New Year’s Eve. He did this with his family, possibly exposing all the children to lead contamination, but at the least they could read their fortunes in the metallic globs. His family’s New Year’s tradition of pouring molten lead into water was brought over to Canada when they emigrated from northern Europe. He says he thinks it was widely practiced in the Baltic and Scandinavian countries. This is a method of scrying called molybdomancy. I’ve only ever seen it in the Djamaa el Fna in Marrakesh, Morocco, but it is popular in Germany and Finland where tin is often used instead of lead. Auberon spent New Year’s Eve with friends of friends in the Highlands of Scotland and there they left the front door open. People came in each with a lump of coal to bring the householders a warm year. Sounds like a heartwarming custom to me! It is possible to start your own customs and traditions. Marnie, a very health conscious organic locavore, has made her own tradition of doing a cleanse and a fast to make sure that her body has a fresh start. On New Millennium’s Eve (inspired by the Malleus Maleficarum), Steve, a Texan, says he wore a cow mask and set off explosives to welcome in unseen entities, but he only did it once. 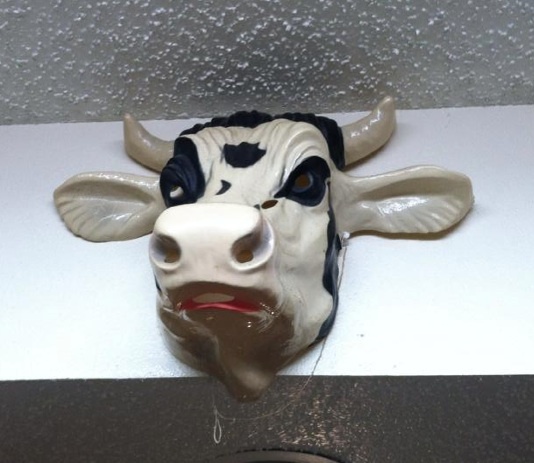 Steve’s cow mask, courtesy of Steve. 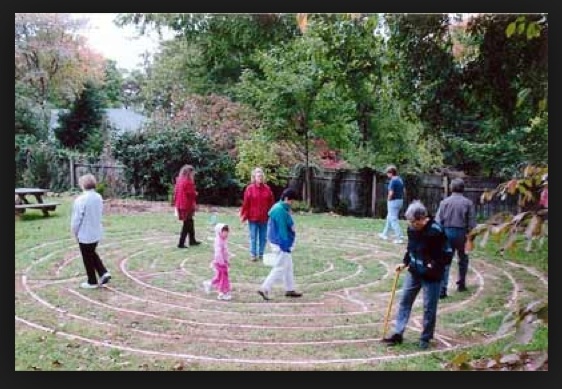 Thomas Jefferson Unitarian Universalist Church in Charlottesville, VA has a Labyrinth Walk every New Year’s Eve. 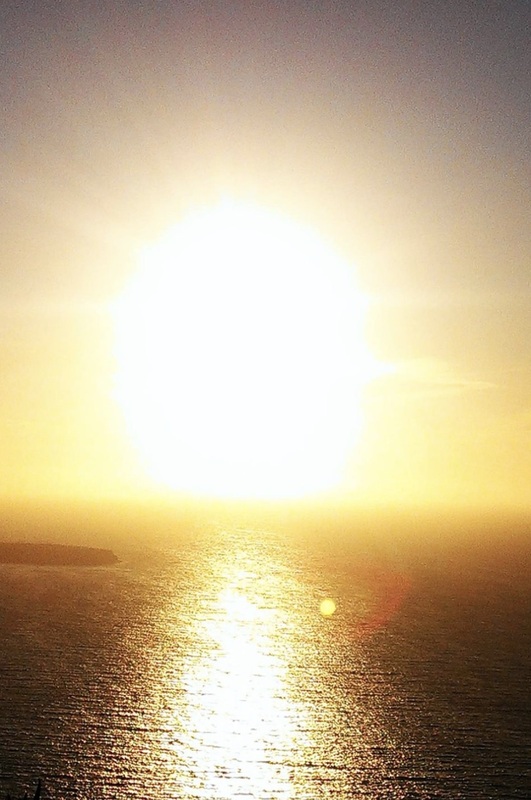 It is a wonderful, thoughtful and meditative way to begin each new year. It is done with the intent of following and trusting one’s path for the year, knowing it will take one exactly where one wants and needs to be. The walk is accompanied by the live music of the hammered dulcimer, played in an intuitive manner that follows the energy of those walking the labyrinth. A lovely woman I know named Suzanne has been the dulcimer musician for the past 9 years. It is a very special part of her New Year tradition. Life is made richer by traditions and customs as long as one doesn’t become obsessive-compulsive about engaging in them. Modern life is often made boring by some people’s drive for sameness. Some of these simple New Year’s customs are the most basic form of sympathetic magic, a type of magic based on imitation or correspondence. If you have any interesting or unique New Year’s customs please comment. Thanks. Fahrusha is a professional intuitive who works in New York City.